After finally having enough of looking like a squid and doing undue harm to the transmission hitting a false neutrals on upshifts regardless of lever type, I decided to do what ever was required for reverse shift. For a temporary 75 cent solution, I removed the single object (spring) and wedged a neoprene washer inside the side stand pivot. This works amazing well to hold the side stand in it's up position while still being able to be moved. Will be using magnets on the frame and sidestand where they make contact, adding a fail safe for the time being. Took a ride today down to my personal Isle of Man course about 15 minutes from my house which consists of some 100mph corners and lots of bumps, held perfectly in place the whole hour long ride. Should work just fine until I can get my welder to weld on a tab on the backside of the stand so I can mount the spring on the back side, looks perfectly doable. Most importantly, the transmission feels completely transformed into something much more positive and direct feeling on the upshifts while still doing just as well downshifting, feels like a totally different bike to me. Getting an ugly spring out of sight is a nice bonus! 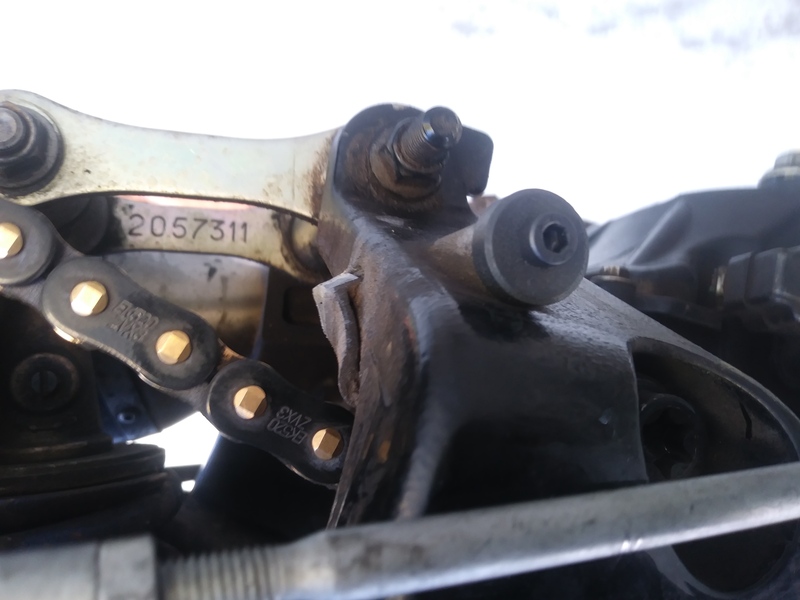 Next project will be to find a higher quality ball joint shift rod and eliminate the inadequate/prematurely wearing stock one. Last edited by Bryanc123; 10-30-2018 at 11:13 PM. I'd get something more positive on there ASAP. Just a hose clamp or something to hold a temporary spring. I visited a friend in the hospital once whose side stand was down in a hundred mph corner. It wasn't pretty. I'm with you on that, neoprene washer probably won't last through the week of commuting, not unexpected. Was just looking for a quick way to finally go to GP pattern. Hose clamp is actually a good idea for holding the spring. Last edited by Bryanc123; 11-01-2018 at 08:19 PM. Unsafe is how I role. Buddy across the street said I was the luckiest SOB he's ever met, fair bit of it's calculated though. I've already taken off the neoprene washer and replaced it with a metal washer. Side stand is really hard to move, but that's kinda the idea. I'm keeping a close watch on it and will be looking at a way to relocate the spring as soon as I come up with an idea that will work best. Having to kick a sidestand up and down is well worth being able to go reverse. For me, it's the ONLY way to go with these bikes, actually feels like a halfway good transmission now. Tap dancing on the shifter while hard on the gas is strangely addictive too. If it comes down to it, I'll lean my bike up against parked cars, gas pumps, buildings ect… before I'll go back to standard. Last edited by Bryanc123; 11-03-2018 at 12:52 PM. Would love to eventually get a quick shifter for it. 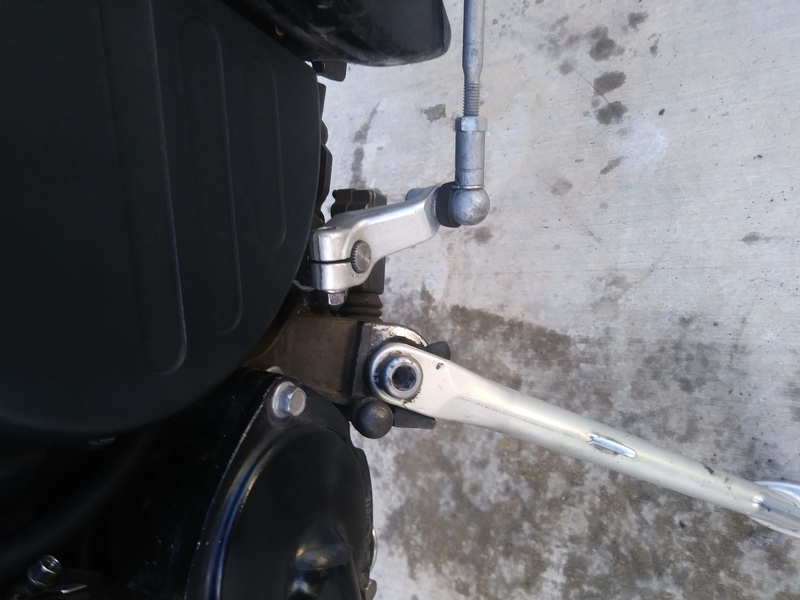 I've always felt that when shifting clutchless, the closer I came to duplicating a quick shifter on up shifts the more positive and seamless the transmission felt. I know that some folks on this forum don't believe in quickshifters having a place on a Speed Triple ridden on the street, or reverse pattern for that matter. At the very least though, if it adds to the fun and addictiveness why not?